Well!… that was quite a stretch, wasn’t it? I didn’t intend to drop of the face of the blogging earth for all eternity but yet that’s what happened. The truth is, I was anticipating that I would have more time in the Spring and Summer… that was not the case. Rather, the opposite is true. I will try not to let that happen again. Anyway, I am going to hop back in the proverbial saddle and share my latest redo. This bed was a fabulous find, and very reasonably priced. I smiled quite a bit when I found it. It even had the rails and slats. I took it home and got to work. Pretty much all of the embellishment detail was ruined. The once beautiful carved rose crown was broken and hanging, and the little square carvings on each corner were loose and one was missing. I removed all of that and began thinking. Thinking and painting. 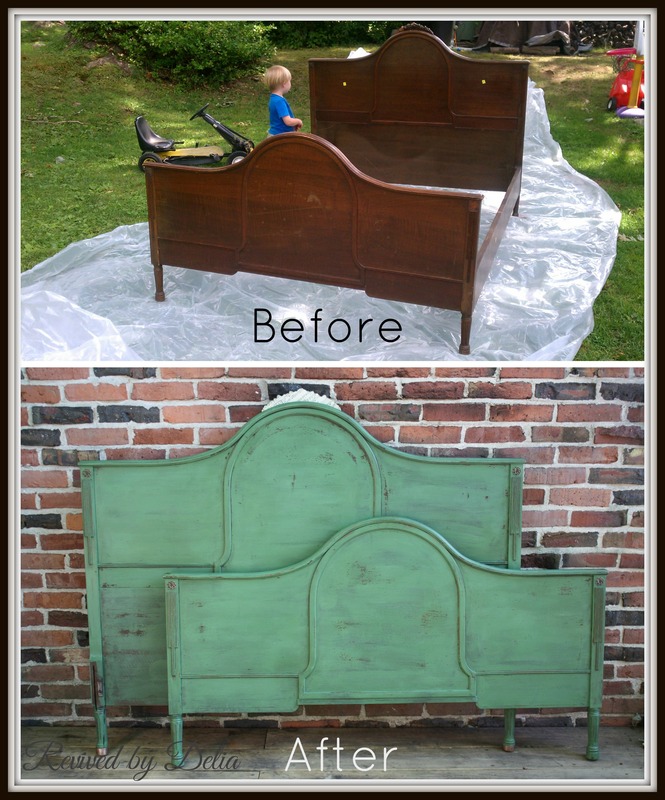 I painted one coat of The Old Fashioned Milk Paint Company‘s Lexington Green (which after drying looked more like a greenish grey) and one(ish) coat of Tavern Green, going back over some places that needed a bit more. (Tavern Green over Lexington Green turned out very similar in color to Miss Mustard Seed’s Boxwood.) 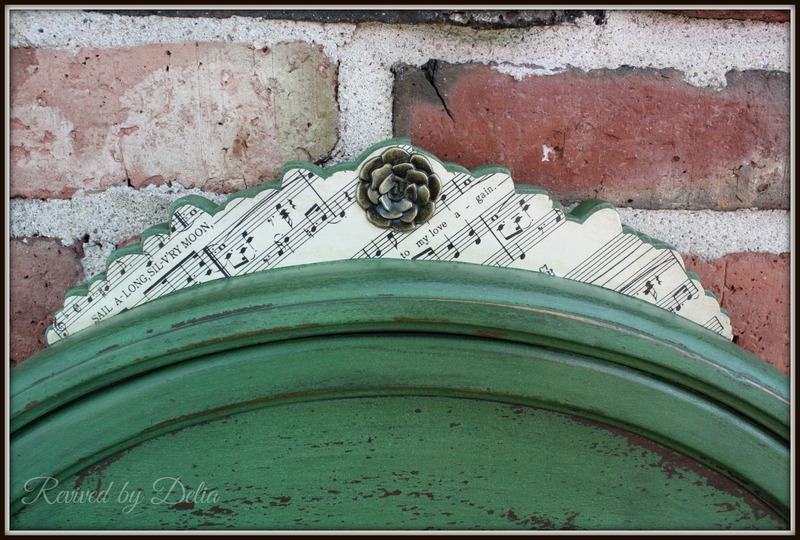 Once that dried, there was some natural milk paint chipping, so I had at it with my scraper. Then I went over it quickly with the sanding block. I have to say, I love the final finish. 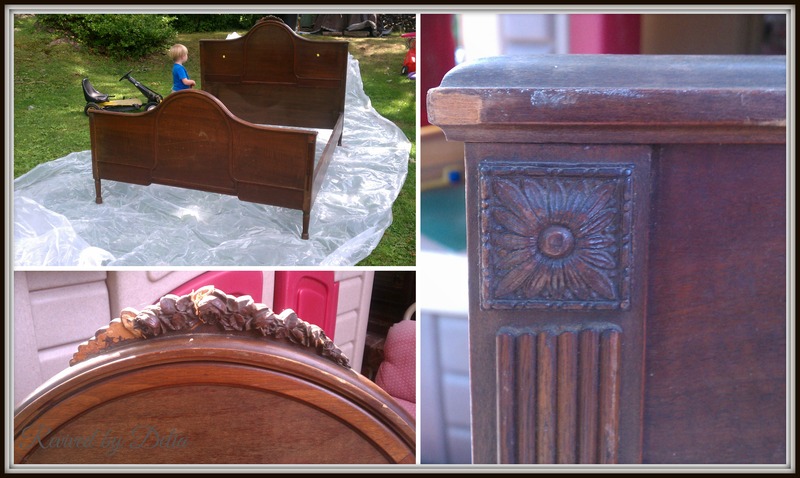 One coat of clear wax, with some Miss Mustard Seed Antiquing Wax in key areas and this baby was almost done. In the areas where I had removed the embellishments, I decided to do this…. So much better! What do you think? This turned out soooooo pretty! I bet it won’t last long in the shop! This is gorgeous makeover. I love the color you chose. Thanks for sharing at Vintage Inspiration Party. OMG! Your vision was marvelous! Some lucky person will snap it up quickly! Thank you Deb! I hope so! Beautiful color. I love the little added touch of music notes on the top detail. What a cute idea. Thank you Jessica – I have only worked with MYO chalk paint (generally just latex mixed with plaster of paris). 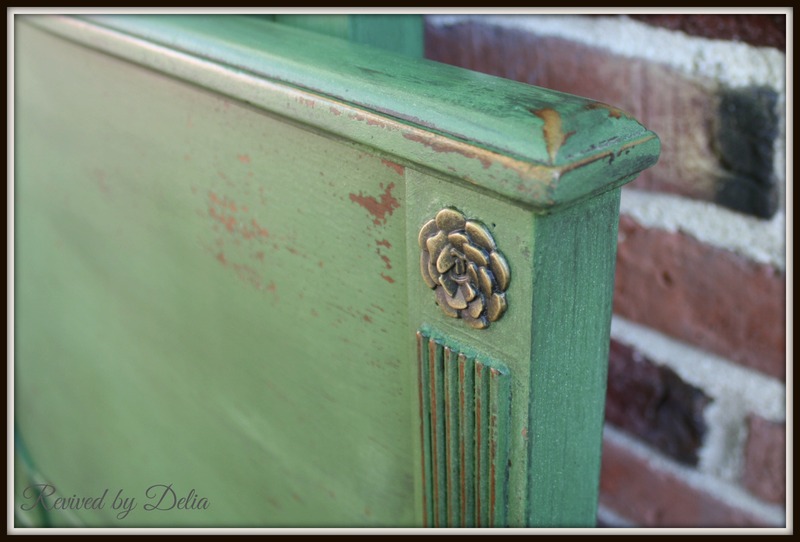 I like it and the finish comes out nice and smooth as I have heard bought chalk paint does. 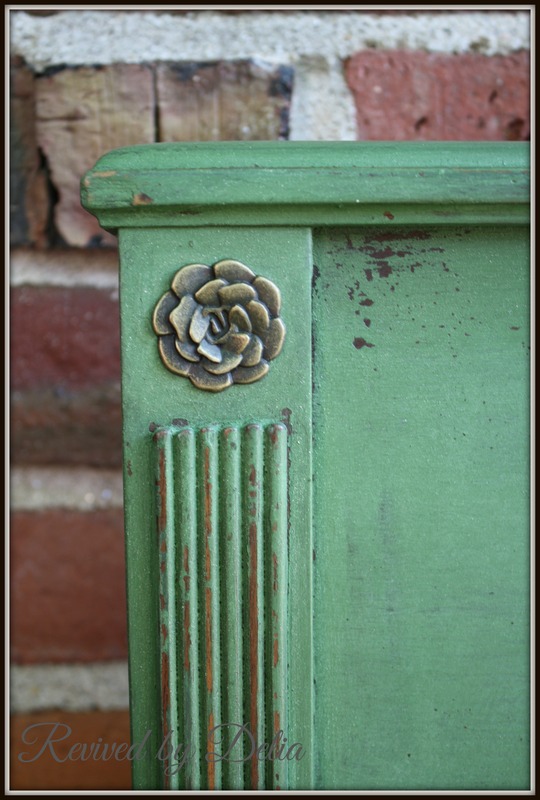 But it doesn’t chip like milk paint does, which is the finish I tend to be drawn to. They are very different paints. 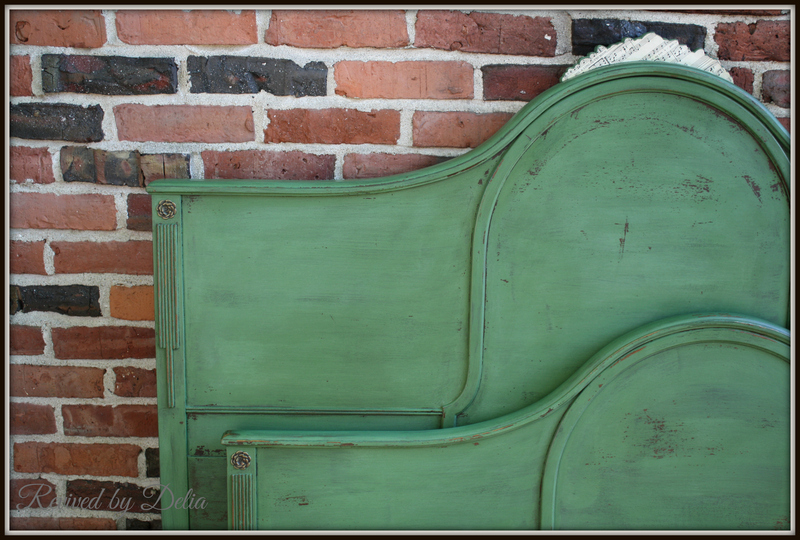 If you can deal with the unpredictability of milk paint, I highly recommend it! 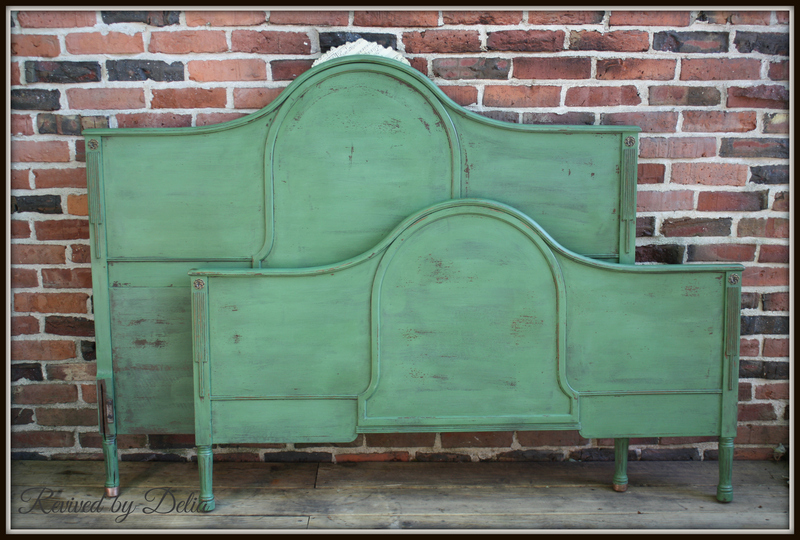 I have a similar bed I was thinking of painting with Chalk paint (my go-to), but I’ve been dying to try milk paint. I think you have inspired me to do that!!! It’s beautiful! Thank you – please share how it comes out! I would love to see! You could design a beautiful room around that stunning bed!